People First: Future Wales : Children's Education - Why isn't the "investment" delivering? Future Wales : Children's Education - Why isn't the "investment" delivering? Siân Caiach looks at school performance. Local Authority Schools for primary and secondary education are provided, maintained and staffed by the City or County Councils who administer that Area. 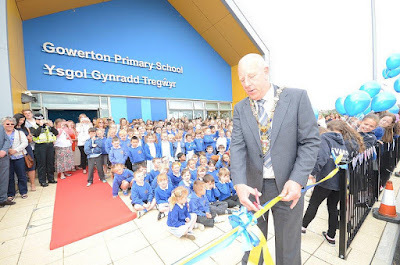 The Welsh Government, anxious to improve our standard of education, adopted a policy to do so involving encouraging new builds and school amalgamations. The idea was to fund these projects centrally but have the schools matched funded by Council borrowing. It was called the Modernising Education Project, MEP .This was to give our children an improved education at reduced cost to the Councils as Welsh Government put in a proportion of the finance. There are now, I believe, unintended and serious consequences, both financially and culturally. Assembly members have had deep concerns over the quality of education in Wales. The focus has been on improving the buildings because many buildings were old and poorly maintained. Educational results may have not been shown to be directly related to the age of buildings, or the total number of pupils but Local Authorities always seem to like new building projects as they are visible structures of positive change and modern builds economically often have the advantages of low maintenance and lower running costs. However, they are very expensive projects and can be very disruptive to communities where they are built and often have larger numbers of pupils who have to travel long distances.The trend has been to close smaller schools and build bigger ones with larger catchment areas. Economies of scale and lower running costs, but not necessarily more successful in hitting educational targets. Then there is the the actual teaching part of Education. The number of curriculum and test changes reflects what has been seen as poor performance of educational standards in Wales. We are currently in the process of changing our curriculum once more with the outline improved plan to be released next year, so we are still not good enough? Where I live, this is the official, upbeat presentation of the MEP currently on the Carmarthenshire County Council website. Some £250 million has been invested in schools across Carmarthenshire – and more is on the way. Since the county council launched its Modernising Education Programme, massive investment has taken place in both primary and secondary schools. To date, eight new primaries and two new secondary schools have been built, with major refurbishment and extensions in another 37 primary schools and 11 secondaries. Work is continuing with two new schemes expected for completion soon – a new build at Trimsaran and an extension and refurbishment at Coedcae. New schools are also being built for Ysgol Pen Rhos in Llanelli and Ysgol Parc y Tywyn in Burry Port; and an extension at St John Lloyd. The MEP is funded by Carmarthenshire County Council with support from the Welsh Government’s 21st Century Schools initiative. The recent replacement for the School I attended half a century ago. "£100m is to be invested over the next three years to accelerate the delivery of the flagship 21st Century Schools and Education programme, Cabinet Secretary for Education, Kirsty Williams and Minister for Welsh Language and Lifelong Learning Eluned Morgan said today. In addition, £30m will be released from the programme in future years for immediate investment in capital projects that will contribute to the goal of reaching a million Welsh speakers by 2050. This is a shared priority with Plaid Cymru." The money will bring the total invested over the life of the programme to almost £3.8bn. The first phase of the programme will finish in 2019 having invested £1.4bn to support the rebuild and refurbishment of more than 150 schools and colleges across Wales. The second phase will see a spend of £2.3bn. However, no information on the improved school standards promised with the shiny buildings. As in other fields, we lag behind. The Programme for International Student Assessment (PISA) is a global bench marking study of pupil performance by the Organisation for Economic Cooperation and Development (OECD) . It provides a comparison of what 15-year-olds within participating countries know and can do in the core subjects of science, reading and mathematics. Additionally, contextual information collected from pupils and their school enables associations between performance and other factors, such as pupil engagement or teaching resources, to be compared between and within participating countries. In the last set of results published in 2016, Wales had not improved on previous scores and was bottom of the UK league and still middle ranking in the overall scores. The WG ambition for Welsh pupils to achieve top 20 status was dropped officially in 2017. How relevant this Pisa scoring system is in practice is disputed and our teachers are already stressed by increasing paperwork and the pressure to obtain the other desired goals, such as 5 grade C or above GCSE passes. Under funding of education in Wales compared to England was present before devolution and continues. It is not clear that putting the "improvement" money into buildings is the best use of funds. However, Councils can borrow to fund "capital projects", i.e. new builds and these funds are also contributed to by Welsh Government, the money referred to above. In other cases, a scheme which seems to be failing to produce the desired results might be paused for further examination of the reasons for failure and alternative strategies available. Not here. We are going to build more new schools with very little evidence that it is the most efficient spend on education in the circumstances. With Councils chosing the new school sites, they may be influenced by local politics rather than real need. Currently money spent by Councils on education per pupil averages out at about £678 less per pupil in Wales than England [source NASUWT] and the average figure per pupil across wales spent by local authorities is over £5,000 but in real terms has dropped around £370 in the last 6 years up to 2017 [BBC NEWS Dec. 2017]. This compares to stagnation rather than a drop in funding in England. The Councils have to produce this money from their incomes. About 80% comes from Welsh Government and the rest from the Council tax. However, the money for capital projects which funds the new school builds is borrowed by councils, usually at low interest rates and long terms, up to 50 years. This is regarded by these local authorities as very much "free money" with no consequences. The same favoured Architects and Constructors seem to get a lot of the work in various areas and the temporary construction jobs are much lauded as a boost to the economy, often with the promise of a handful of apprentiships during the build. Is this working? I'm not convinced. The Wales Audit Office Report shows that the funding cuts are expected to be recouped from "commercial operations". In a pretty stagnant economy this could be a tough ask, however keen the Colleges are on selling their services. "We have examined whether the Welsh Government is fulfilling effectively its oversight role to ensure that, despite financial constraints, further-education colleges are financially well placed to deliver the Welsh Government’s expectations. We concluded that, while generally sound, the Welsh Government’s funding and oversight arrangements would benefit from a longer-term and more integrated approach. In response to reduced funding, colleges have cut part-time provision and costs substantially and are aiming to develop their commercial operations to increase revenue". More cuts and less opportunities for skill training. Part time adult courses especially have been lost, so less second chances for those who fail to get the skills they need at school. Having devolved government closer to the people should improve the management of public services and the economy in general. There is sometimes little that government can actually do in some sectors, but in education the Welsh Government is surely firmly in the driving seat? Why then is the performance so poor? Lack of money for school staff , equipment and building maintenence but a major program of new school building pushed forward regardless of results. I have yet to see the research proving that new schools, in themselves, improve education. The new builds do look very nice, are perhaps more pleasant to work in and produce temporary construction jobs. What is the degree of educational improvement exected from the MEP ? Who argued for this plan and where are the predictions of the improved results expected from new schools? Do areas with more new schools show better results? Are we spending enough money in the right places? However, the fact that the running of schools is not funded by the "free money" of permitted Council borrowing means that more "efficency savings" (cuts) are being made by Councils who cannot afford to keep the current levels of teachers and resources on their budget of "real" money. Many schools, even new, shiny ones are being asked to make significant cuts in their running costs. Does this really make sense? There is a common belief that teaching is the lynch pin of school education. Research may be available to show that en suite classroom toilets are a more significant driver of excellence, but I've never seen it. Small Countries may do better as their management of services and resources should be more focussed and more efficient? In Welsh Education, where are we going wrong? We in Wales are criticised for not "catching up" with the rest of the UK in many areas but the gap remains. In large part perhaps, due to the chronic underfunding in many areas. relative to the rest of the UK. Its not a level playing field any means. Labels: . carmarthenshire county council, . Siân Caiach, education, Wales. Whilst the article concentrates, rightly so, on the failures of school funding as a failure for effective learning, the inability of a large number of pupils to learn effectively remains as a fundamental problem. In 1926 Dr Samuel Orton realised that children and young adults failed to read and write and effectively learn due to neurological disfunction. In 2005 the Welsh Government published their "Routes for Learning" strategy to address the problems that Orton recorded in 1926. We still more than 10 years later are still discussing failures of education, that pupils lacking the ability to learn cannot be taught. The website "The autism centre" published two articles namely www.theautismcentre.co.uk/anatomy.html and www.theautismcentre.co.uk/autistic-reading.html.